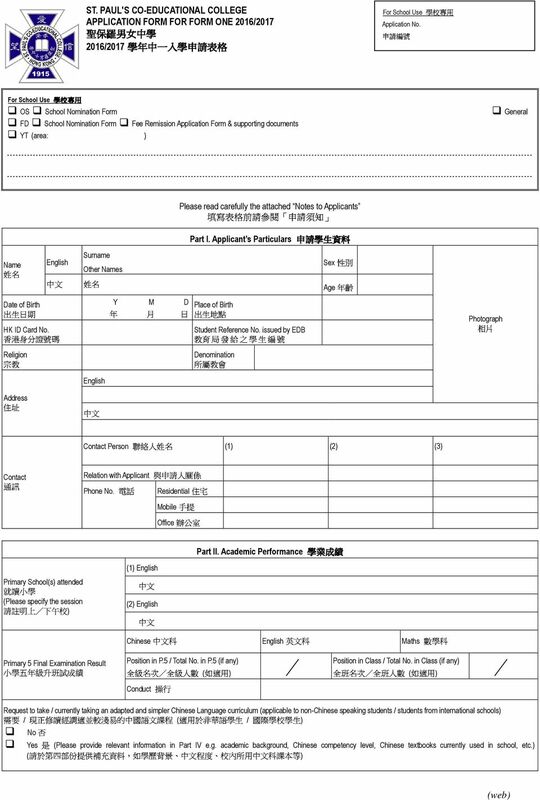 Download "Microsoft Word - (web)_F.1_Notes_&_Application_Form(Chi)(non-SPCCPS)_16-17.doc"
4 其 獎 請 項 註 明 頒 發 機 構 及 年 份 Part III. 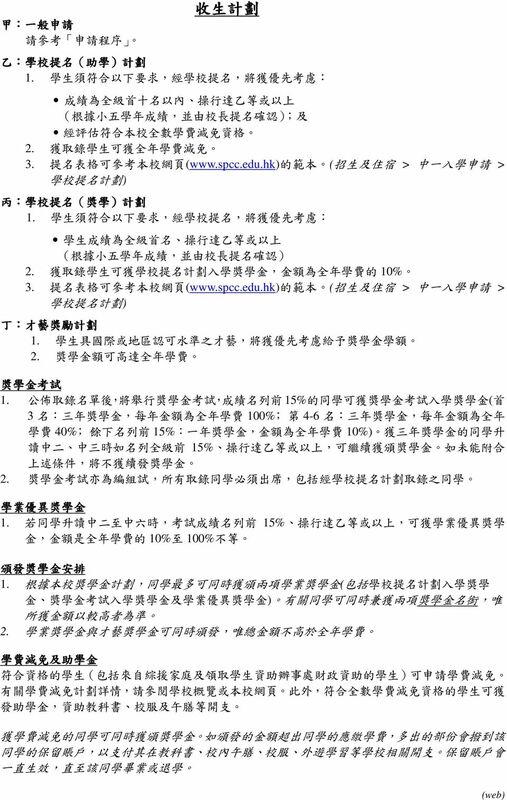 Other Information (if any Awards (Please specify issuing organization & year 服 請 務 註 明 機 構 及 年 份 Voluntary Services (Please specify organization & year 課 外 活 動 其 他 資 料 料 ( 如 有 現 成 資 料 料 如 (Separate sheets if necessary 有 需 要, 可 另 加 紙 補 充 Extra-curricular Activities 其 他 Others 補 充 資 料 Part IV. 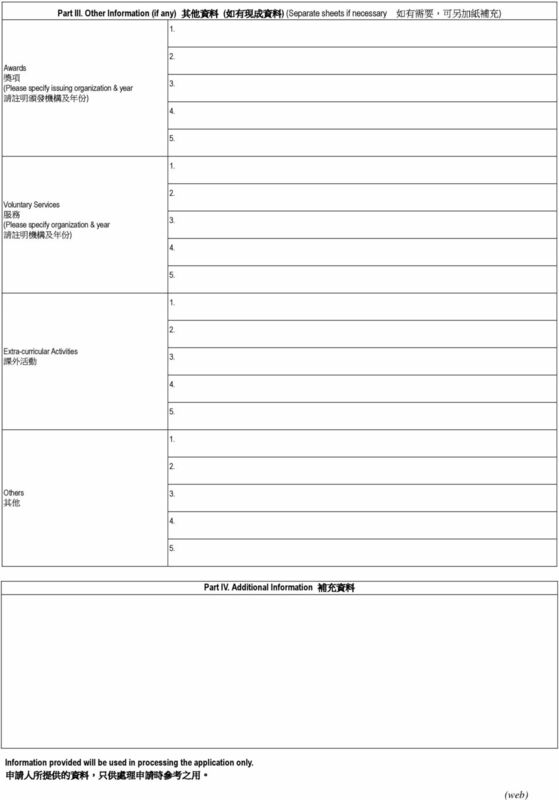 Additional Information 補 申 請 人 所 提 供 的 資 料, 只 供 處 理 申 請 時 參 考 之 用 Information provided will be used in processing the application only. 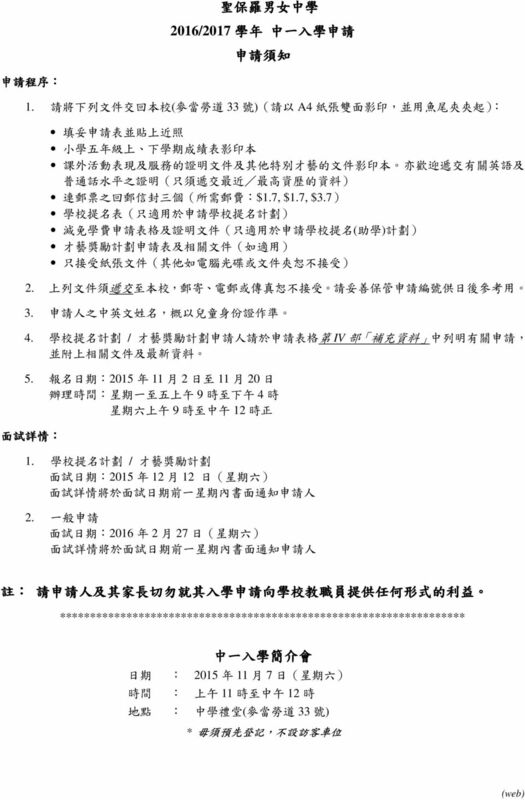 5 聲 明 Part V. Declaration I declare that: (1 I am the parent/guardian of the above-mentioned applicant. (2 I understand the purpose for which the personal data provided by means of this form will be used and my rights for data access/correction. 本 (3 人 聲 To the best of my knowledge and belief the information contained in this form is true and correct. If false information is supplied, this application will be rendered null and void. (4 I submit photocopies of all relevant documents with this Application Form. (5 I am aware that St. Paul s Co-educational College is a Direct Subsidy Scheme School. Form Three students will not be allocated subsidised Secondary 此 明 4 places through EDB and they may continue their Form Four studies in the same school. 表 為 明 格 現 上 白 內 隨 述 此 的 申 表 資 請 格 料 表 人 全 提 的 供 屬 交 家 的 正 各 長 個 確 有 人 無 關 / 資 訛 證 監 料 明 護, 的 文 人 倘 用 件 若 ; 途 之 有 副 虛, 本 報 和 以 資 有 供 料 關 參 查, 考 閱 則 及 本 ; 改 申 正 請 資 作 料 廢 的 ; 權 利 ; I confirm, on behalf of the applicant, that I would apply for a St. Paul s Co-educational College Form One Place in. 本 人 決 讀 本 定 中 人 為 四 知 上 悉 述 聖 申 保 請 羅 人 男 申 女 請 中 貴 學 校 為 直 接 資 助 校 中 三 學 生 將 不 會 經 教 育 局 獲 分 配 其 他 政 府 資 助 中 四 學 位, 學 生 可 在 原 校 升 家 學 年 中 一 學 位 簽 署 日 長 期 / 監 護 人 姓 名 Signature of Parent/Guardian Name of Parent/Guardian Date 校 印... School Chop 茲 收 到 申 請 人 中 一 聖 入 保 學 羅 申 男 請 女 中 表 學 收 據 家 長 / 監 護 人 向 聖 保 羅 男 女 中 學 一 St. Paul s 學 生 姓 Co-educational 名 College Receipt of Form One Application Form 遞 交 之 中 一 入 學 申 請 表 乙 份 Form One Received from Parent / Guardian of an application form for ( Name of student 收 表 日 人 期 簽 署 admission to Form One at St. Paul s Co-educational College. 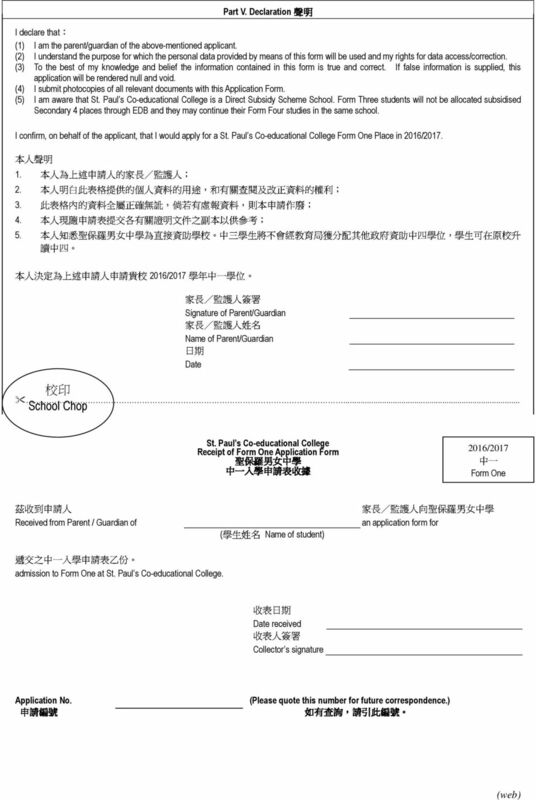 申 請 編 號 Date received 如 有 查 詢, 請 引 此 編 號 Collector s signature Application No. (Please quote this number for future correspondence. 重 要 日 程 路 1 目 錄 2 報 名 流 程 5. 3 報 名 應 注 意 事 項 4 壹 報 考 資 格 貳 報 名 5 更 料 6 7 A/C with Bank( 受 款 行 名 稱 ) : YUANTA COMMERCIAL BANK CO., LTD. SWIFT CODE : Bank Address( 受 款 行 地 址 ) : APBKTWTH 3F, No. 210, Sec. () P.1P.2 () P.2 () 2015/2016 P.2 () 2015/2016 ( ) P.3P.11 () P.12 () 2015/2016 1. P.12 2. P.13P.17 3. P.17 4. P.18 5. P.18P.19 6. P.20P.22 7. P.23 8. - P.1 () P.1P.2 () P.2 () 2015/2016 P.2 () 2015/2016 ( ) P.3P.11 () P.12 () 2015/2016 1. P.12 2. P.13P.17 3. P.17 4. P.18 5. P.18P.19 6. P.20P.22 7. P.23 8. P.24P.28 9. P.29P.30 10. P.31P.34 11. P.35 12.